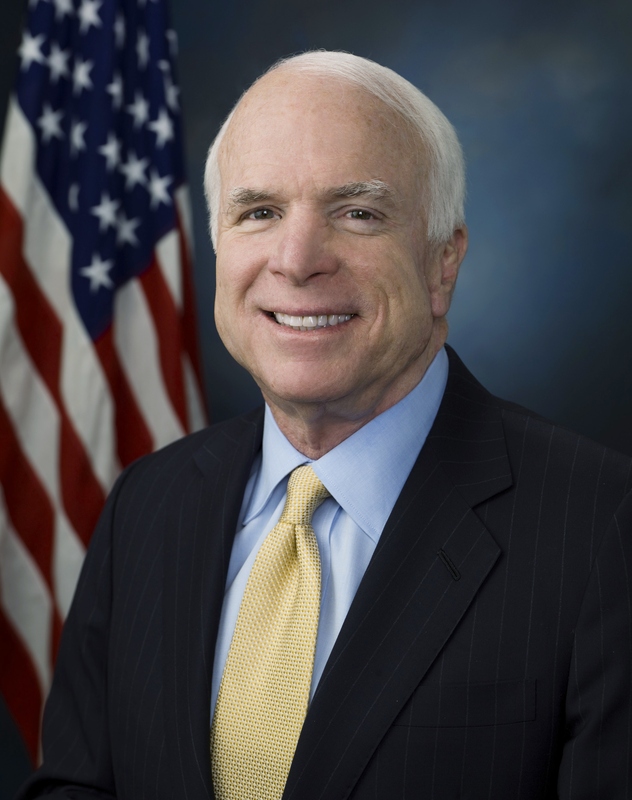 Place of Death: Cornville, Arizona, U.S.
John McCain was an American politician. A Republican, he served as a Member of the U.S. House of Representatives from Arizona, from January 3, 1983 to January 3, 1987, and a U.S. Senator from Arizona, since January 3, 1987 to August 25, 2018, his death. He was the Republican Party’s nominee for President of the United States in 2008. He was also a candidate for the Republican Party’s 2000 presidential nomination. John was born at the Coco Solo Naval Air Station, Panama Canal Zone, to American parents. He was the son of Roberta (Wright) and John Sidney “Jack” McCain, Jr., a prominent admiral and submarine commander. At the time of his birth, the Panama Canal was an unincorporated territory of the U.S., and John’s father was serving there. John’s paternal grandfather, John Sidney “Slew” McCain, Sr., was also a prominent admiral, and a pioneer of aircraft carrier operations. John’s ancestry was English, Scottish, Scots-Irish/Northern Irish/Irish, and distant Welsh. John was married to businessperson, philanthropist, and humanitarian Cindy McCain, until his death. Cindy is of half Swedish descent. John had three children with his former wife, model Carol Shepp; and four children, including columnist Meghan McCain, with Cindy. His brother is actor and newspaper reporter Joe McCain. John’s patrilineal line can be traced back to his third great-grandfather, Joseph W. McCain, who was born, c. 1773, in Scotland. John’s paternal grandfather was John Sidney McCain, Sr. (the son of John Sidney McCain and Elizabeth-Ann Young). John’s grandfather John was born in Mississippi. John’s great-grandfather John was the son of William Alexander McCain and Mary Louisa/Louise McAllister. Elizabeth-Ann was the daughter of Samuel Hart Young and Catherine/Catharine Weeden Small. John’s paternal grandmother was Catherine/Katherine Davy/Davey Vaulx (the daughter of The Rev. James Junius Vaulx and Margaret Garside). Catherine was born in Arkansas. The Rev. James was the son of James Vaulx and Eliza Geddy Fenner. Margaret was born in Ashton under Lyne, Lancashire, England, the daughter of Samuel Garside and Mary Ellin Dickens. John’s maternal grandfather was Archibald “Archie” Wright (the son of Franklin Alexander Wright and Nancy Adeline/Adaline Atkins). Archibald was born in Mississippi, and was an oil wildcatter. Franklin was the son of Archibald Wright and Mary Paterson/Patterson/Peterson. Nancy was the daughter of Robert Taylor Atkins and Martha Jane Anderson. John’s maternal grandmother was Myrtle Mae Fletcher (the daughter of Azariah Denny/Dennis Fletcher and Martha Melinda/Malinda “Mattie” Kidwell). Myrtle was born in Texas. Azariah was the son of Azariah Denny Fletcher and Mary Moore. Martha was the daughter of William Kidwell and Sarah “Sally” Higgins. Sarah was born, c. 1814, in Kentucky. Of course he disliked Trump. But it was in bad taste how he said his vp candidate wasn’t invited. He will be the next Aretha Franklin? How so?